Working towards a decade of women: Join us! Working towards a Decade for Women - Come and be part of it! We are proud of the strength and breadth of the 2017 Women Candidates list. We are pleased to announce on behalf of Lib Dem Women and the Campaign for Gender Balance our 2017 General Election initiative for women candidates - #LevelUpLibDems. The sessions will be led by some of the party’s most experienced candidates and trainers. Full details can be found by clicking in this tab. 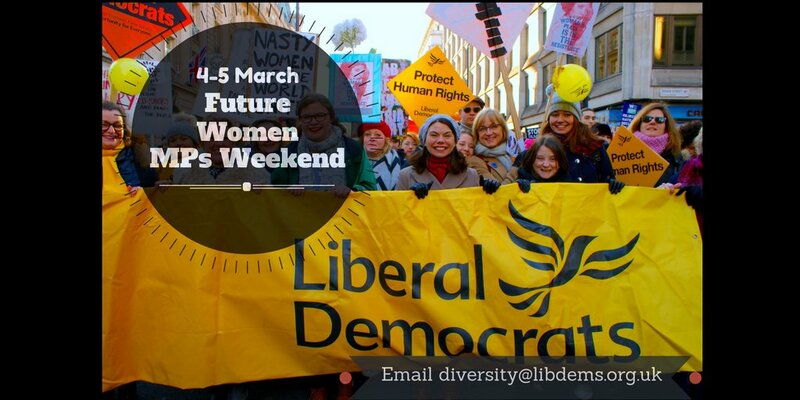 The Future Women Member of Parliament Weekend is an exciting residential training weekend specifically designed for women who might be interested in standing for Westminster. It is run by the Campaign for Gender Balance (CGB) which is now a part of LDW. Jo Swinson, Tessa Munt and Jenny Willott all started their successful quests for a seat in Parliament at a FWMPs Weekend, and so could you! Participants will receive expert training from top trainers and Party representatives on the skills and knowledge needed to stand for parliament, personalised advice and guidance on their political career, and the chance to network with other women interested in standing. If you would like to apply for a place, print off, complete and return the application form to women@libdems.org.uk. You will find the application form by clicking on this tab. Please spread the word about this fantastic opportunity to women members who you feel are strong applicants. On January 21st 2017, the first day of Donald Trump’s Presidency, women-led marches, welcoming all participants, will take place across the world. We call on people of all genders to march in London as part of an international day of action in solidarity. Click here to find out more! Join Daisy Cooper at St Alban's campaign day! The Prime Minister is set to ask Parliament to trigger article 50 by the end of March, but St Albans voted 63% Remain with an 82.5% turnout. In keeping with this, St Albans Lib Dems will be hosting a big campaign day to speak with voters about BREXIT and the upcoming county elections. Campaigning will kick off from 10am. For more information, click on this tab! Join LDW at Training for Trainers! The Diversity Team will be running a two-day Training for Trainers Course from the 7-8th of January 2017. Being a trainer is a tremendously rewarding experience as it allows you to empower other members of the party, particularly women, using your unique skill-set. Are you interested in becoming a trainer for the Liberal Democrats? If so, click on this tab to find out more.